Orange Is the New Black's Crazy Eyes and Miley Cyrus's VMA performance recall the Harriet Beecher Stowe classic, even if their creators didn't intend to. Miley Cyrus probably hasn't studied much theater history. She was most likely completely unaware of the legacy of minstrelsy that influenced her performance at MTV's Video Music Awards. She has nevertheless been heavily criticized for appropriating black music and dance while demeaning her black backup dancers. A few people have defended her against the accusation, and others have said that that they were unaware while watching it of what made Cyrus's performance racist. I'm not surprised. When I teach theater history to undergraduates I meet very few students who have heard of minstrelsy before I tell them about it. Even when I teach graduate students, I find that many of them think American theater history began with Eugene O'Neill. They are completely unaware that the first nationally popular American play was Uncle Tom's Cabin, transformed onstage from an anti-slavery text into a racist spectacle whose influence survives till today. Just as present-day filmmakers are on the lookout for bestselling novels that can be made into blockbuster films, 19th-century theater managers looking for hits adapted popular books for the stage. The first known stage version of Stowe's Uncle Tom's Cabin was performed even before the final sections of the serialized novel had been printed. The second production was part of an evening of entertainment that included a tightrope walker and a blackface burlesque of Othello. Though George Aiken's somewhat faithful adaptation was the most successful version, Southern pro-slavery writers parodied the novel in productions that turned Stowe's sympathetic portrayal of slaves on its head. Theater managers everywhere competed to have the most outrageous show by adding bands, songs, dances, even fireworks. The popularity of the scene in Uncle Tom's Cabin when Eliza is chased across a frozen river by dogs led to the inclusion of more and more live animals in Tom Shows, including mules and even elephants. Eventually producers began casting "real Negroes" to bolster their claims of authenticity: Their shows, they boasted, depicted black life as it really was—full of happy go-lucky, animalistic should-be slaves. That these black performers still had to wear blackface betrayed the truth—the Tom Show idea of black life was not authentic at all. Simultaneously, minstrel shows—combinations of skits, dancing, and music characterized by caricatured representations of buffoonish black people by performers in black face, slapstick situations, and a send up of aristocratic pretensions—rose in popularity from a working-class entertainment to a middle-class one. By combining the story of Uncle Tom's Cabin with the central tropes of minstrelsy, Tom Shows, as these spectaculars came to be called, presented song and dance representations of black life from a white perspective. Even after the Civil War, Tom Shows continued to tour the country and attract large audiences from all walks of life. Just as these performances' dances, like Jumping Jim Crow, were purportedly observed among real black people and then caricatured, Miley Cyrus, surrounded by black women half-dressed as animals, attempted and perverted a form of black dancing called twerking. Rather than aping aristocratic pretensions, like minstrel shows did, Cyrus sent up her own past as an innocent child by embodying the good girl who nevertheless knows she wants it. But it was minstrelsy just the same. Audiences may not have recognized the tropes upon which Cyrus drew partly because even people who know about Tom Shows think of them as being performed by men. In reality, by 1871 America had at least 11 scantily-clad, all-female minstrel troupes performing in blackface. Even in male troupes, "wench" characters, played by men in light makeup (they were "yaller gals") and depicted as possessing overwhelming sexual appetites, made public representations of eroticism a common element in Tom Shows. Cyrus wasn't wearing literal blackface in her performance, but the tradition of a little white girl at the center of a minstrel performance is as old as minstrelsy itself. 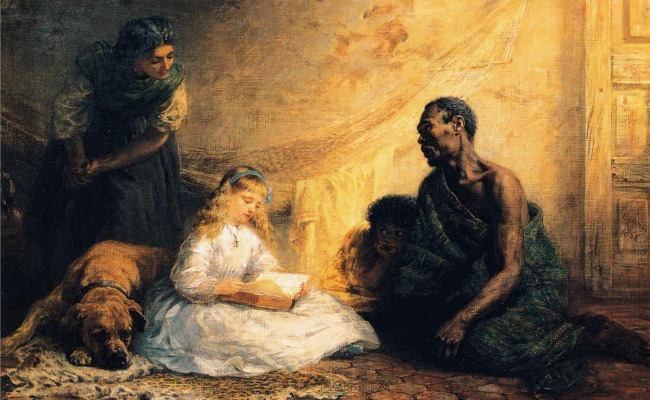 One of the most popular characters in Uncle Tom's Cabin was Little Eva: the blonde, lily-white daughter of conscientious slave owners who is adored by white and black people alike. The uncivilized slave Topsy, who says that she cannot love anyone because no one has ever loved her, is nevertheless moved to tears by Eva's death and vows thereafter to be good. In 19th-century productions, Eva's centrality to the narrative was made literal: The moment of Little Eva's death put Eva centerstage, on her bed surrounded by mourning slaves. In at least one production, so many slaves appeared that the stage was full of them, while others peered in at windows and stood in doorways. In the more spectacular, upbeat adaptations, she doesn't die but rather sings and dances with the happy slaves. Tom Shows did not decline in popularity until well into the 20th century—only after they had made their impact in Hollywood. The metatheatrical 1936 film Dimples, featuring Shirley Temple as a young performer (Dimples) who is playing Little Eva in a stage production of Uncle Tom's Cabin, combines the sentimental portrayal of the little white girl with the "isn't she just cute as button dancing with those negroes" version. Her death scene brings about tears from the actors on stage and those in the on-film theater audience, and just as in the original story Topsy is redeemed by her ability to feel, the villain in the movie is redeemed by the sentiment evoked by Eva. As an epilogue to the play, the curtain comes up on a minstrel troupe, and Dimples dances at the center of a group of blackface performers. Whether or not the creators of Cyrus's performance know it, American entertainment has been so suffused with these images for so many years that they live in our shared subconscious and are often referenced without artists or audiences even realizing it. Netflix's Orange Is the New Black has been praised for its mostly female, racially diverse cast, but it has also been rightly criticized for drawing upon black experiences to tell a white girl's story. The creative staff of Orange Is the New Black or the talented actor who plays Crazy Eyes, Uzo Aduba, may not have been thinking about Uncle Tom's Cabin, but both Topsy and the Crazy Eyes character are black women who were adopted and "civilized" by white parents. Crazy Eyes, like Cyrus at the VMAs, even sports Topsy's iconic hairstyle. Contemporary pop culture may be driven by Hollywood, but back in the day, it was theater—particularly traveling troupes like the Tom Shows—that created a shared national culture. This history will not go away, whether we acknowledge it or not. Without an awareness of the way the iconography of minstrelsy informed so much of the entertainment that has come after it, history is bound to keep repeating itself, just like it did two Sundays ago. Holly L. Derr is a writer, director, and professor of theater. She writes about theater, film, television, video games, and comics.